Mina A’ Salam Dubai is a magical Arabian Fortress that is hidden on the Arabian Gulf. Mina A’ Salam en-captures Arabic traditions and experiences of rich culture into a resort that is utterly unique in look and feel, and every discovery made here is unbelievable. Nestled away, guests will be in awe from the moment they enter; Arabian culture comes to life before you. Each guestroom is outstanding in design. Flamboyant colours, exotic lanterns and Arabian arches grace each spacious guestroom. Views of the resort are intoxicating; palm trees, coupled with the Arabian breeze and sun rises and sun sets, are all enjoyed from the private balcony viewing point. Every luxury exaggerates the lavishness of the Arabic culture and the walk in rain showers and spacious dressing areas are modern day touches, adding to overall comfort. The choice of casual and signature restaurants at Mina A’ Salam take you on indulgent culinary journeys across the world; each mouthful is to be savoured. For an enchanting time, offering therapeutic treatments for your well-being journey discover Talise Spa. Cherished moments will be created at the captivating Mina A’ Salam. Talise Spa is a spa facility that knows no limits. Exuding comfort, health and well being, the Spa offers treatments that are dedicated to rejuvenating guests. A sanctuary that is hidden away within palm trees, each luxury treatment room offers a serene and encapsulating environment and the skilled therapists focus on your well being needs. Yoga classes and pilates sessions are offered by the Spa. Yoga poses as the sun sets in the Dubai Skyline are charming moments, never to be forgotten. Jumeirah Beach is the Mina A’ Salam’s golden sands playground. In the Arabian heat, clear warm waters are beautiful; taking a dip in salty waters is a heavenly cooling aid. Fitness Centre – Talise Fitness is a much needed fitness centre at Mina A’ Salam, which includes: – 2 squash courts, 25m indoor pool, 5 floodlit tennis courts. Wild Wadi Waterpark – Relaxing in the heat is an easy way to spend the day, but be sure to go thrill seeking at Wild Wadi Waterpark. Waterslides and flumes keep guests of all ages thoroughly entertained. For any daredevils, try the ‘Jumeirah Sceirah; a water slide that will have your heart in your throat. Souk Madinat – Located at the Madinat, Mina A’ Salam guests are spoilt with the Souk Madinat; a souk that is authentic in design and Arabian experience. For some traditionally Arabic shopping visit the Souk and explore ornaments, sculptures, carpets and rugs. The souk is not just for shopping. 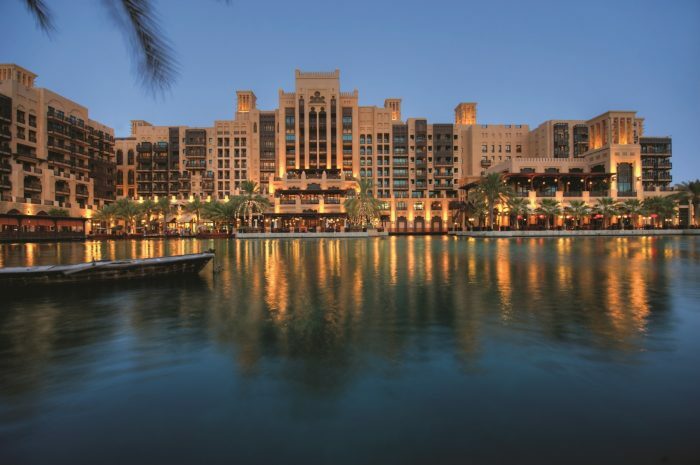 Boasting an array of restaurants, guests are spoilt for choice at Souk Madinat. Honeymoons ought to be once in a lifetime experiences and Mina A’ Salam, Dubai is a one of a kind resort. Exceptional beauty unfolds at this resort and honeymooners are privy to such Arabian opulence that they will be overwhelmed. Hidden away on the Arabian Gulf, Mina A’ Salam encompasses all things Arabian; textures and fabrics, architecture and interiors help transport guests into Arabian history. Succumb to the Arabic guestrooms and discover a unique haven that awaits. Relish in the rich culture as you absorb the incredible colours and beauty of elaborate intricacies. Spacious, bold guestrooms form the centrepiece of your honeymoon and guests retire to desirable Arabian excellence. Fascinating sun sets and sun rises can be enjoyed from private balconies; bursts of colours light up the sky as you sip a refreshing cocktail. Whether relaxing by a pool, shaded by palm trees or meandering through the property, breathtaking scenic views unfold. Surrender at Talise Spa to discover relaxing and invigorating couple’s treatments and leave the spa feeling revitalised. Mina A’ Salam kindly becomes an unforgettable backdrop to your honeymoon and you will be immersed in modern day luxuries, overarched by Arabian culture and tradition. Mina A’Salam is located on Jumeirah Beach Road, Dubai, U.A.E. Marvellous, flavourful cuisines form a gastronomy journey that is unmatched. Dishes to suit guests’ every mood are catered for and just a few have been listed below. MJ’s – Steak is enjoyed with an array of sauces. Primed meats are perfectly cooked and served with gourmet sides. Pierchic – Serving freshly caught seafood, there is much to be enjoyed. Segreto – Sophisticated Italian flavours are served with breads and olives and a fine choice of wines to warm the soul. Zheng He’s – Serving a fusion of western and eastern interpretations of Cantonese cuisine, each mouthful will be tempting. The Wharf – influenced by English pubs, homely, comfort foods are served with hearty portions. Al Fayrooz Lounge – Evenings are spent gazing out to the lush gardens and waterways. Bahri Bar – Views of the sea are exquisite from Bahri Bar and classic cocktails are fabulous. TRILOGY – A nightspot covering 3 floors; Amazing DJs from around the world all gather here. Trilogy has dedicated rooms for different music genres and the roof top terrace that is beautiful at any hour of the evening.